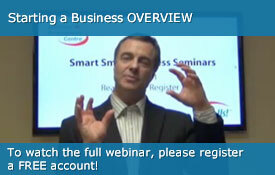 BusinessConnect™ Webinars | Business webinars that help you improve and grow your business. Everything you need to know about running a business. Discover what business structure you can base your company on and which one will suit your needs best. Starting a business does not have to be hard. 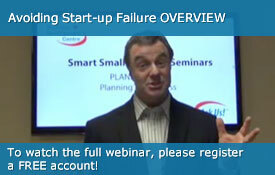 Avoiding the 50% Business Failure Rate. Incorporation – The Best Kept Secret. The Advantage of Government Tax Accounts. Big Legal Protection at a Low Cost. Utilizing the Web to Grow Your Business. 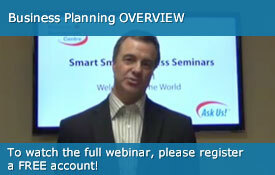 Learn the how a business plan will dramatically improve your business. You will learn to set goals and the specific tactics to get accomplish them. 8 Principles of ANY Business Success. The Benefits of Things Not Going as Planned. Dedication to Commitment and Improvement. In this age, you need to have an online presence if you want to be successful. A website is your least expensive and most powerful sales tool if it has been designed and “optimized” properly. 10 Do’s and Don’ts of Web Success. The Price of the Web World. Why a Domain Name is Your Best Investment. Your business name, slogan, product or service names, and web or print content – these are assets you need to keep safe. Learn to legally protect them with Trademarks or Copyrights to prevent others from stealing what is rightfully yours. Steering Clear of Costly Violations. Who is Infringing Your Legal Right? The Risks of Common Misunderstandings. 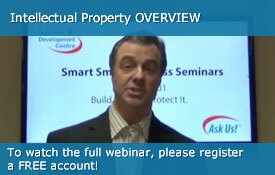 Selling Intellectual Property For Profit. Familiarize yourself with small business bookkeeping, financial statements, taxes and more. 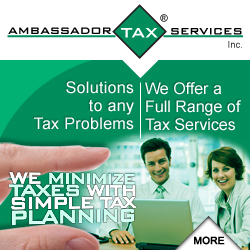 We want to show you how to minimize the taxes you pay and ensure a larger tax return. 5 Keys to Small Business Tax Savings. The Best Money Saving Deductions. The Do’s and Don’ts of Business Deductions. Corporate Tax Advantages vs. Registrations. Every business on the planet has the same building blocks towards higher sales and profits. From the smallest to the largest, it all starts with getting “good” leads. How and where do you get the “right” leads? How do you “convert” leads into a sale, or better still into multiple sales? Discover Our Business Growth and Success Model – For EVERY Business. 5 Steps Towards Growth and Profit. The Multiplier Effect of Small Improvements. Making Bigger Sales With Each Order. The Power of Recurring Business. 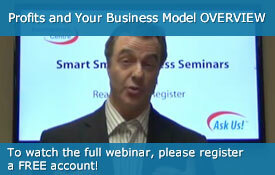 Expert Advice on Increasing Profit Margins. Over 50% of small businesses fail by the fifth year. Why is that? It is NOT what you think. Yes, there are common business reasons for failure such as poor business planning, weak marketing and management. The ten tips show you HOW to do these things successfully the first time, and WHY so many entrepreneurs fails to get it right. Why People Can’t See What They Are Doing Wrong. Testing Your Business (at very low cost) to Launch Successfully. How Entrepreneurs Made Their Businesses a Success. "The seminar was crystal – as in clear. Very easy to listen to understand." "My experience was very good. Questions were answered and I received my documentation very quickly." "Experience was excellent very helpful online assistance provided." "Very self-explanatory. Easy to use. Received information electronically in a very timely manner."